During January 2008, an excavation was conducted along the southern fringes of the tell (el-Haditha; Permit No. A-5355; map ref. 1951–4/6520–3), along a line where infrastructures should be installed. The excavation, undertaken on behalf of the Israel Antiquities Authority and underwritten by the Partner Company, Ltd., was directed by H. Torge, with the assistance of Y. Lavan and the late S. Ya‘aqov-Jam (administration), Y. Elisha (preliminary inspections), T. Meltsen and R. Mishayev (surveying and drafting), T. Sagiv (field photography) and M. Shuiskaya (pottery drawing). The tell, which is mentioned in the Bible and identified with the ancient city of Hadid, is situated on an isolated hill, 147 m above sea level, on the border of the northern Shephelah, south of Nahal Natuf (Fig. 1). The site benefited from its location along the main road from Lod to Samaria and the road from Lod to Jerusalem, as well as from the high water table that facilitated drawing water and small wadis that pass along its fringes and fertile soil. During Iron Age II, the region was included in the territory of the Kingdom of Israel. A mosaic floor had been discovered in the past on the southeastern edge of the tell. 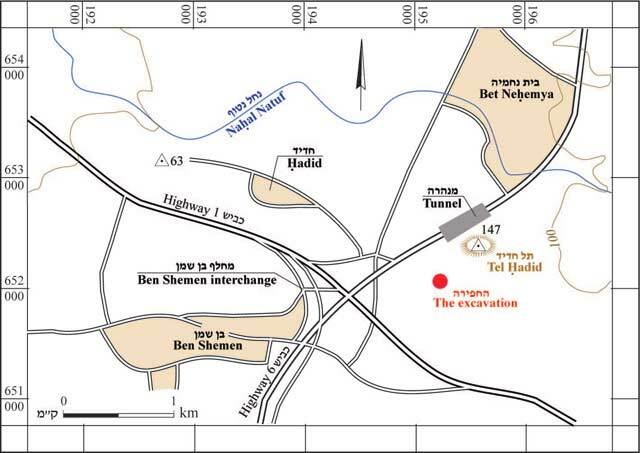 On the tell’s western edge, along Expressway 6, a burial cave that dated to the Iron Age was discovered (Permit No. 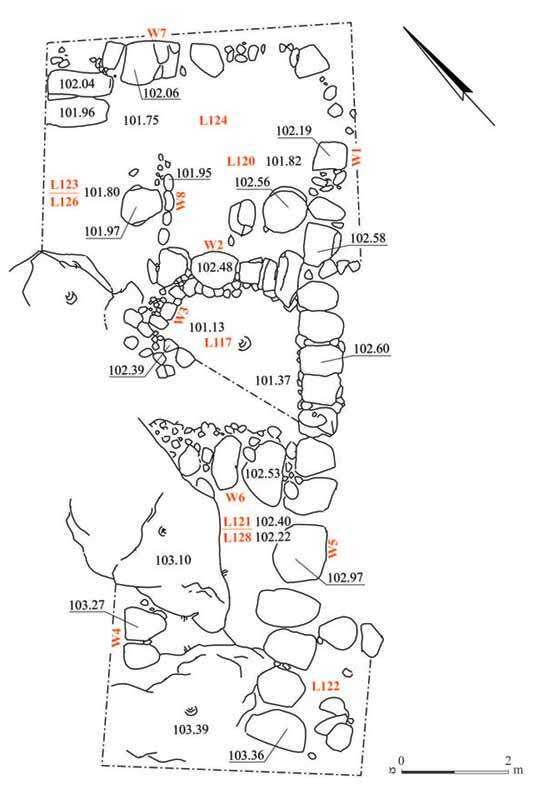 A-3300) and two large buildings, numerous installations, a cultic hoard and two Neo-Assyrian documents, all dating to the Iron Age, were revealed (ESI 19:44*–46*; HA-ESI 117). Three squares and seven half squares were excavated along a northwest-southeast axis, beyond the narrow wadi south of the tell (Fig. 2). The excavation area was divided into three groups. Squares 1–3. A tamped-earth floor mixed with crushed chalk, which was set on a foundation of small tamped fieldstones in Squares 1 and 2 and on bedrock in Square 3, was exposed. This was probably the floor of a residential building or a surface that separated the dwellings from the wadi to their north. A particularly large amount of potsherds was discovered. Most of pottery fragments overlying the floor dated to the eighth century BCE, whereas the potsherds from the floor’s bedding dated to the ninth century BCE. A few fragments of pottery vessels that dated to the tenth century BCE and even the end of the eleventh century BCE attest to a presence at the site during these periods. Fragments of pottery vessels from the Persian period were discovered on the surface. Squares 4A–4C. A building characteristic of the Iron Age was discovered (Fig. 3). The building included three long rooms, oriented northeast-southwest in accordance with the incline of the slope, which were founded on high bedrock. The walls were built of very large stones, which were partly smoothed, and some of the walls utilized the high bedrock. The southern room (L121) was delimited by walls in the east (W5) and north (W6), the high bedrock in the south and the high bedrock and a wall (W4) in the west. The tamped-earth floor of Room 121 was overlain with ceramic finds that dated to the eighth–seventh centuries BCE, including a jar handle with a non-inscribed, worn LMLK seal impression. Smoothed bedrock (L128) was discovered c. 0.2 m beneath the floor. It had been used as a floor level in an earlier phase and fragments of pottery vessels from the ninth century BCE were found above it. The smaller central room (L117) was delimited by walls in the south (W6), east (W1), north (W2) and west (W3). Smoothed bedrock served as the floor of the room. The northern room was divided by a partition of medium-sized stones (W8) into two parts. 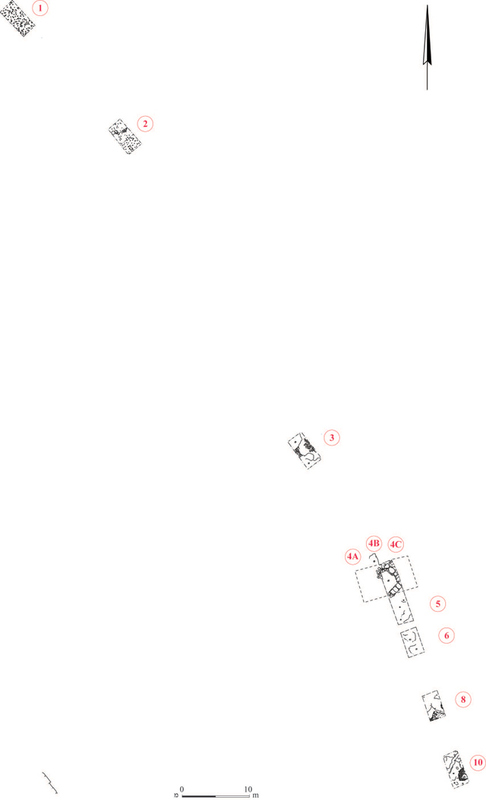 The eastern part (L120) was delimited in the south (W2), east (W1) and north (W7). The western part (L123) was not excavated entirely and the wall that enclosed it on the west was not revealed. The two parts had tamped-earth floors. A probe (L126) excavated below Floor 123 exposed the smoothed bedrock. Two large smoothed stones were incorporated in Wall 7 in the northern corner of the area; these were probably part of a staircase that led northward, to the other side of the wadi. Squares 5, 6, 8 and 10. High bedrock, overlain with a layer of small stones, which was probably ancient alluvium that contained fragments of pottery vessels from the ninth–eighth centuries BCE, was exposed. A preliminary probe in Square 10 revealed fragments of a tabun base that indicated this area was either a courtyard or located beyond the houses. It seems that the area was inhabited only in the Iron Age. The earliest discovered potsherds dated to the ninth century BCE, with a few dating to the tenth century BCE; the three-room house was probably established in the ninth century BCE. The latest phase of the building is dated to the eighth and seventh centuries BCE; the handle fragment bearing the LMLK seal impression dates the final use of the structure to the seventh century BCE. Very few potsherds, dating to the Persian period, were only discovered in Squares 1–3; hence the building ceased to be used prior to that time.